Numerous studies have shown that Yoga can be an effective solution for easing chronic low back pain. It is a natural approach that has lasting effects, but it takes a commitment to your own health. If you want a quick fix pill, this is not your solution. But if you are ready to commit to a regular yoga practice, you could end up saying goodbye to pain medications. Back-related function was better and symptoms were diminished with yoga at 12 weeks; and clinically important benefits, including less use of pain medications, lasted at least six months for yoga, with thorough follow-up of participants. The studies listed here focused on patients with mild to moderate pain with non-specific cause. Always seek medical advice before beginning yoga as a treatment for any physical aliment, and make sure to find a yoga instructor with experience working with low back pain who can modify postures for physical limitations. Kaya Wellness & Yoga has experienced, trained instructors that can help you develop a program to address your chronic back pain, through one or a combination of Yoga, Aerial Yoga, Private Sessions, & Massage Therapy. 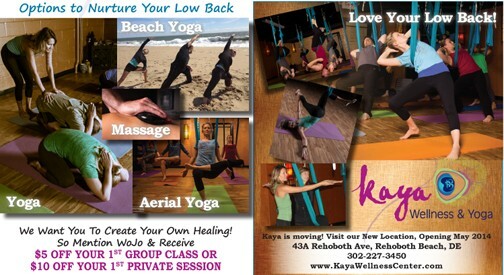 If you are ready to create your own healing, instead of turning to a prescription, contact Heather at Kaya Wellness & Yoga.